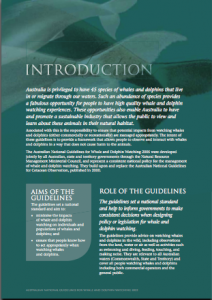 Wildlife Tourism Australia Inc officially endorses the Australian National Guidelines for Whale and Dolphin Watching 2005. Wildlife Tourism Australia (WTA) is an incorporated association that promotes the sustainable development of a diverse wildlife tourism industry that in turn supports conservation. WTA’s membership comprises wildlife tourism operators, government bureaucrats, researchers, and others with a critical interest in the connection between wildlife conservation and sustainable tourism. One of the main objectives of Wildlife Tourism Australia Inc. is to sustain the industry and conserve the wildlife resources on which businesses within the the industry depends, in addition to supporting the ideals of wildlife conservation and animal welfare. WTA believes that whaling, like many other consumptive uses of wildlife, is a complex issue with a range of moral, economic and ecological arguments and perspectives, and that some forms of whaling are part of traditional cultural practices in some countries. The issue of the impact of whaling on conservation and animal welfare is well-publicised. Less well recognised is the economic impact of whaling on the whale-watching industry. Whales have captured the public imagination, and over the past two to three decades, whale watching has become an increasingly significant form of tourism globally. Appropriately regulated and controlled whale watching tourism is a lucrative and sustainable form of tourism. Commercial whaling in the southern ocean could have a negative impact on the whale populations that migrate along the Australian coastline and to the whale watching industry that depends upon them. There is no justification for ending the existing moratorium on commercial whaling, or for increasing the numbers of whales killed for scientific or other purposes.